Kotobukiya has released some new photos of their upcoming Hellraiser III: Hell on Earth – Female Pinhead Bishoujo Statue. We last saw the unpainted prototype for the statue at San Diego Comic-Con 2018. The 1/7 scale statue will stand about 9″ tall atop a Lament Configuration themed base. She joins other Bishoujo Horror Statues such as Evil Dead’s Ash, Freddy Krueger, and Jason Voorhees. Pre-orders are now live in Japan, with U.S. pre-orders likely to go live shortly. The Female Pinhead Bishoujo Statue will be released in February 2019. The statue is priced at 11,000 Yen (about $99 USD). You can see the new photos by clicking the headline of the story. 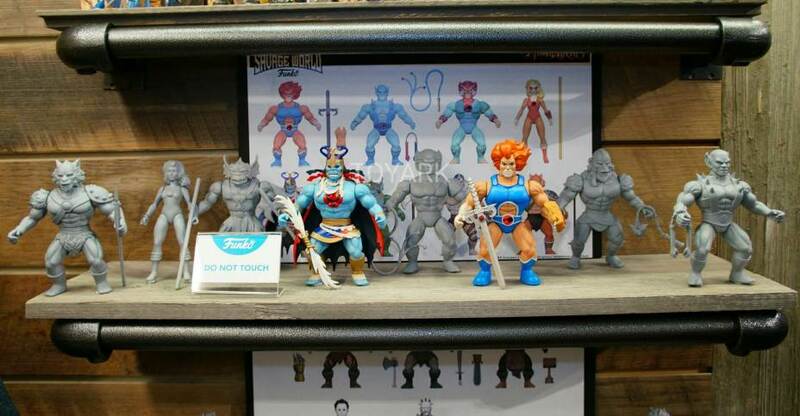 Back at Toy Fair 2018, fans got their first look at Funko’s new series of retro Masters of the Universe style action figures. The new line of 5.5″ tall figures is called Savage World, and will feature a wide array of character choices, including Thundercats and Conan The Barbarian. 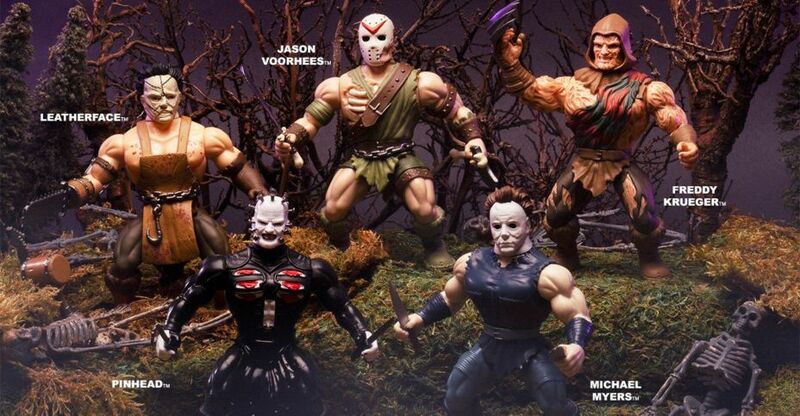 Also coming in this style is a series of iconic horror characters designed to look like fantasy warriors. Funko has revealed that the Savage World Horror Figures are coming in September. Check out the details below and see the photos after the jump. Welcome to your worst nightmares. 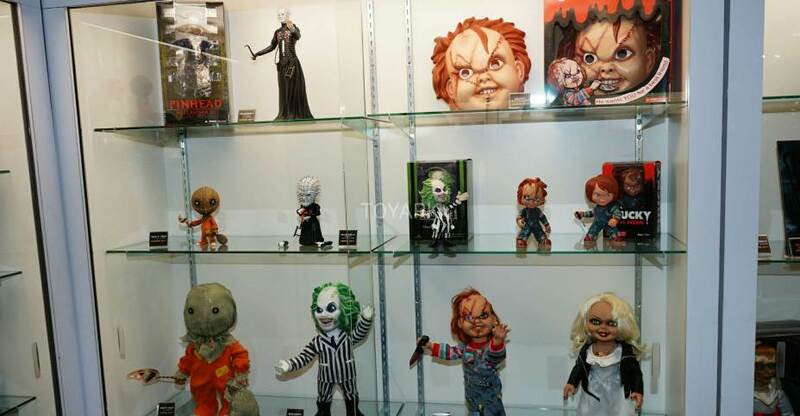 Everyone’s favorite Horror Villains – Freddy Krueger from ‘Nightmare on Elm Street’, Jason Voorhees from ‘Friday the 13th’, Leatherface from ‘The Texas Chainsaw Massacre’, Michael Myers from ‘Halloween’ and Pinnhead from ‘Hellraiser’ – are ready to haunt your dreams and chase you down. Freddy, Jason, Leatherface, Michael Myers, and Hellriaser are heavily armed and entirely fitting additions to the Funko Savage World line. Thanks to Needless Essentials, we have a few photos to share of the new One:12 Collective figures. Check them out for more photos of the One:12 Collective display. 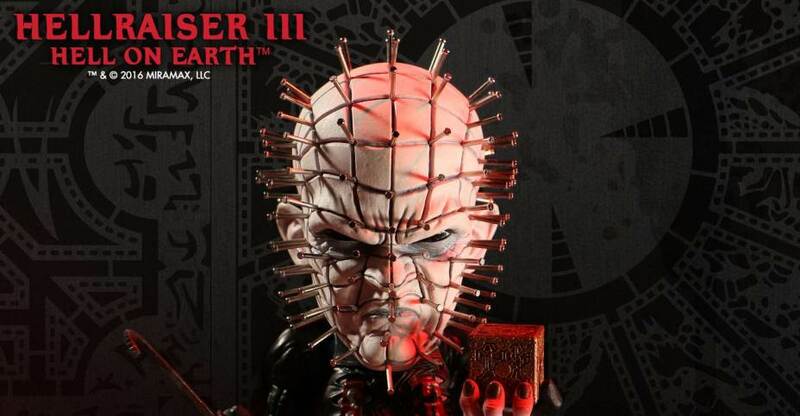 The Hellraiser III: Hell On Earth -Deluxe Stylized Pinhead 6″ Vinyl Figure is priced at $29. It should ship out between May and June. Check out some photos by reading on. Originally known simply at “Lead Cenobite” or Hell Priest, the character of Pinhead is one of horrors modern iconic staples. The original film and its sequel portrayed Pinhead more as a counter balance to the good in the world. The Cenobites used extreme pain as a form of pleasure to to torture those who dare open the Lemarchand’s box, AKA the Lament Configuration. In Hellraiser III, Pinhead’s character was altered drastically, becoming a purely evil entity, bringing death and destruction before being sent back to his dimension. 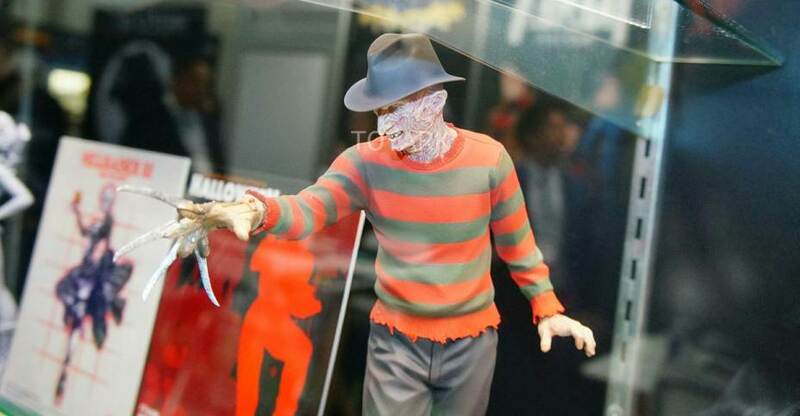 It’s this third installment that many companies are licensing to bring Pinhead figures and collectibles to fans. 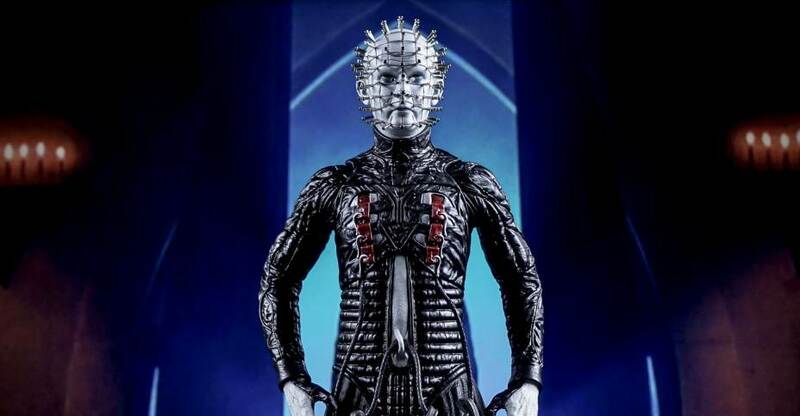 The Hellraiser III: Hell on Earth – Pinhead 12″ Scale Figure by Mezco Toyz is available in stores now. 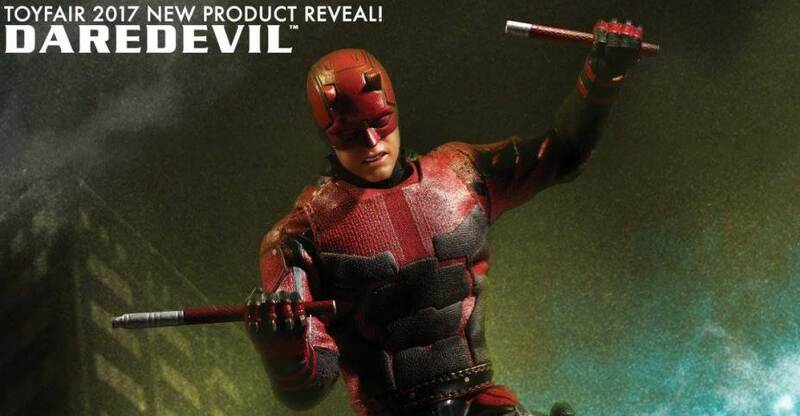 The figure was released earlier this month, and is showing up in Toys “R” Us stores and at many online retailers. Pinhead is mainly constructed of soft vinyl, includes about 7 points of articulation, interchangeable hands, a Lament Configuration and assorted blades. I purchased the figure over the weekend and have a photo shoot and review. 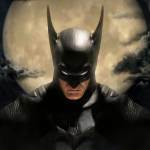 Read on to check out over 45 high resolution images.